A Monthly Journal on Spiritualism and Occult Sciences as Cultivated in India, the Land of Mystery. Calcutta, India. Publisher: P.K. Ghose. Editor: Babu Shishir Kumar Ghosh; Branjii Hormusjii; Motilal Ghose; Piyush Kanti Ghose. 1/1, March 1906-1918(?). 80 pp., $1.25-$3.00 a year. Ghose ( 1840-1911) was a Bengalee journalist, social activist and Vaishnavite (a disciple of Lord Gauranga, the Prophet of Nadia), who established the Amrita Bazar Patrika in 1868, originally in Bengali and then (in 1879) in English, as the voice of burgeoning Indian nationalism. He was also a spiritualist. Because of a bereavement in his youth, and having heard of American spiritualism, he sought out the Calcutta Public Library to learn about the subject and was given by Peary Chand Mittra, the librarian, books by Edmunds, Howitt, Denton and others. On his return to his village he initiated seances, for "Indian Indians," as he said, apparently the first in the country. In 1879, hearing of "European" teachers of vidya in Bombay he wrote Colonel Olcott, inquiring about seeing phenomena and wonders, and traveled to meet him and Madame Blavatsky ("now the deepest of the deep, now as silly as a forward gul of twelve"), where Olcott told him "there were adepts, mainly Hindus, who had acquired almost unlimited powers by the culture of yoga; that Madame was herself almost an adept. The Colonel had himself seen one of them in America. . . . They had been brought to India by these adepts -- Mahatmas -- to serve a purpose of their own which was to benefit humanity generally, and the Hindus particularly, by establishing the Theosophical Society, which would impart the highest knowledge to man." On being told he must join the society to see phenomena, Ghose promptly joined--the first member in India, he thought-- and paid the fee of ten rupees, receiving the sign and password. He stayed with Blavatsky and Olcott for some three weeks, witnessing a few minor wonders (bells chimed by elementals, duplication of items, and the like) but could never overcome his suspicions of fraud and refused to accept the then-current Theosophical doctrine of annihilation after death and the attribution of spiritualist phenomena to "shells." The object of the journal was "to render death--which has a horror for most men--easy to meet with." Ghose's understanding of spiritualism can be discerned from the fact that he deputized a friend in Chicago to visit the Bangs Sisters to obtain a picture of his deceased son, which was later featured in James Coates's Photographing the Invisible, and from his letter to the Progressive Thinker asking for mediums to come to India, specifying that the "manifestations likely to convince and satisfy the people of this country" were materialization, spirit photography, slate-writing, automatic writing and direct voice, etc. A letter from one of the editors to J.M. Peebles, published in the Progressive Thinker, May 9, 1908, complained about the problems of converting Indians to spiritualism, but by 1918 the editors were complaining anecdotally that "In Calcutta Spiritualism is gaining ground rather too fast. We are 'phoned at every ungodly hour to arrange to conduct private circles, all about this city. We have had to attend so many circles during last month as to interfere with our indispensable duties." In a more realistic appreciation, the journal lamented the cessation of the Banner of Light and the general decline of interest in spiritualism: "The Fox girls threw America into a state of greatest possible excitement. Almost every family was induced to hold circles. But getting used to this idea men have ceased to feel that irresistible attraction for the subject as they used to do before. And hence fewer circles are held, and the spiritual papers do not find fresh matter for every issue." The journal regularly urged Indians to try spiritualism themselves to judge its worth, publishing practical rules for seances ("Never talk to two different spirits at the same time . . . . Never smoke or use snuff in a seance," etc.). From the reports of seances, materializations were still regularly being produced as late as 1918. The journal proposed to carry material "calculated to throw light on life after death, on manifestations of psychic experiences and other cognate subjects of the spiritual world or bearing on mesmerism or the Yoga system of the Hindus." It featured articles on "Occult Therapeutics," The jealousy of a Spirit Wife," "The Bangs Sisters, Their Miraculous Feats," "Lincoln the Mystic" (on the supernatural powers of Charles E. Shockle at seances with Lincoln), "The Watseka Wonder," "Indian Jugglers," spirit appearances and phenomena (pelting with stones, etc.) in India together with articles on "How Spiritualism Came into India" and on Hindu theories of the afterlife, and discussions of the Hindu doctrine of eternal progress after death as contrasted with the "Buddhist" idea of reincarnation and rebirth on earth, and attempts to equate the post-morten spheres of the Summerland with traditional Hindu cosmology. Most of the content of the journal consisted of a re-telling or summary of material from a wide variety of current spiritualist publications. Contributions by J.M. Peebles on one of his trips around the world, by Estelle Stead on her messages from her father, and, of course, by Ella Wheeler Wilcox. 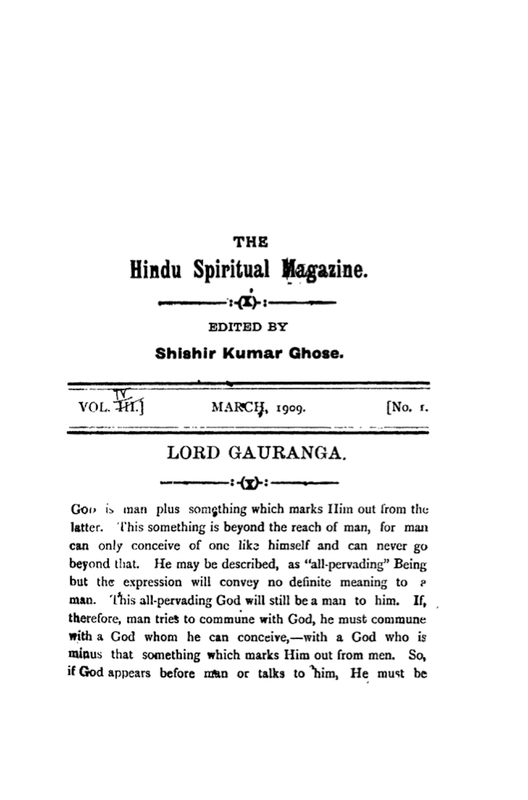 Noted in the Progressive Thinker, December 29, 1906, and July 6, 1907, and in Light regularly, and in Self-Culture (India), February-March 1911, announcing the death of the editor and praising the journal as the first in India to introduce "Western Spiritualism." Stanford University; LOC; Stanford University; Southern Illinois University; BL; BNF, etc.